Laboratory suppliers have unique challenges when it comes to selling their products. Not only do you need an extensive background in biology or chemistry, but you also need to know practical applications. Knowing your product is only rated for -10°C is great, but knowing that your client is running a particular test that might require a lower temperature rating is even better. You are selling to a highly educated group of lab managers and scientists that has specific requirements that they need in the products. Because of the complexity of the products, very often when an organization implements an e-Procurement system lab suppliers are one of the first vendors to be incorporated into the purchasing process. e-Procurement can present some new challenges for laboratory suppliers, from manufacturer data to the electronic ordering process, but all are easily overcome with a little exploration. When it comes to e-Procurement, laboratory suppliers are one of the original users of the systems. Looking back over the past 15 years one of the original e-Procurement systems was SciQuest’s (now Jaggaer) Chemlife system. It offered a way for organizations to shop across multiple suppliers catalogs from one interface. Contract pricing could be loaded to ensure all suppliers presented the best price. It even offered the now popular punchout catalog interface that allowed the end user to see and requisition the actual items they wanted instead of relying on printed catalogs or SKU numbers. e-Procurement has come a long way from the days of just a handful of providers like Ariba and SciQuest. At last count we had over 55 different e-Procurement platforms in our database. While many of these platforms follow the same standard, each one has its own way of submitting a pricing file or sending an electronic invoice. It’s a wonder so many companies struggle with e-Procurement. You might already know some of the challenges that your organization has faced such as platform specific questions such as “How do I submit a price file to Coupa?” or “How do I change the email notification address for our electronic PO’s?”. These questions types of question are usually straightforward once you ask the e-Procurement provider (such as Coupa or Jaggaer). But what about bigger challenges such as data management issues like “What is a UNSPSC?” or “How do I get product images from all my manufacturers?” We’ve already covered UNSPSC’s in a previous post, so let’s focus on the data issues. When you start building a product catalog, whether it is for a punchout catalog or a hosted catalog (both require similar information), you’ll soon realize you may not have all the information on your website, ERP or catalog manager. e-Procurement requires a lot of the common product data fields such as part number, manufacturer part number, product price, list price, product title and product description. Then we get into more granular information such as UNSPSC/s (you did read the UNSPSC post already didn’t you? ), NAICS codes and Units of Measure. Let’s not forget about those product images either. So where does all this product information come from? If you’ve done this before then you can just pull from previous catalogs or spreadsheets. What if this is a new RFP that you’ve won and you’ve never offered an electronic catalog of any sort before, but to fulfill the RFP you need to provide a hosted catalog or punchout catalog? The first step is identifying the products that you need to provide data for. Is it your entire catalog or just specific items relating to the RFP? Now that we have our list of products it’s time to start asking the manufacturers for information. They make the products you sell and of course want you to sell as many of their products as possible, so our recommendation is to setup a conference call with your manufacturer contact. Possibly even send them a sample of the hosted catalog or punchout product file for the data you need. You may be surprised to know that many manufacturers have this data or can assemble it for you. Most recently we were approached by a large tool manufacturer to classify all 4500 of their products into UNSPSC’s. They were getting pressure from their distributors for this UNSPSC data, which means their distributors are getting pressure to provide this to their customers who use e-Procurement. You may have to do some manual work on your side, but the good news is e-Procurement standards don’t change all that much. Things like UNSPSC’s have been the same for almost 15 years. A new version of the UNSPSC does get released (version 19.0501 is the latest as of today), but newer versions only add new category codes, they rarely remove or change category codes. So know that we know the problem, what do we do about it? The good news is that many manufacturers are now including e-Procurement specific data in their data feeds. That will resolve missing data issues or costly backfill projects. There are even a few companies that will even help you clean and merge the data together to make sure it adheres to the same standard. Make sure you have an e-Procurement partner that already works with laboratory suppliers and knows the ins and outs of your industry. Lots of organizations claim to be able to help with e-Procurement, the challenge is to make sure the company has experience with your industry. 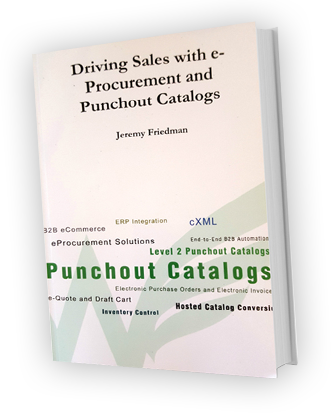 If your organization is bidding on an RFP or just received your first integration request, whether it be punchout, electronic PO or electronic invoicing, you may consider requesting our book Driving Sales Through e-Procurement and Punchout Catalogs. Or set up a quick discovery call with a member of our team. Our team lives in the e-Procurement ecosystem on a daily basis and can help untangle the web of confusion that is sometimes created by e-Procurement.